All Obedience Trials will be indoors, One Ring. Rally will be outdoors. Congratulations to one of our longest standing members--- and one of our youngest! 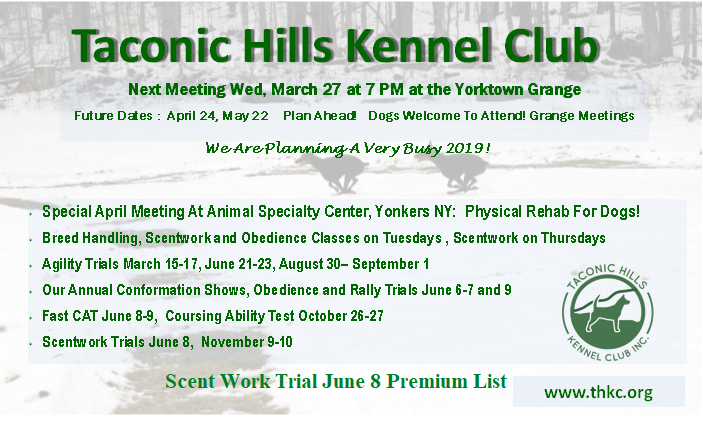 Dr. Kelly Murphy has been an active member of Taconic Hills Kennel Club since she was very young. We are so fortunate to have such an experienced dog person become a veterinarian, choose a specialty that allows us to manage our active dogs and our aging dogs through Rehabilitation Medicine and to have her practice right here at home. She is at the Animal Specialty Center in Yonkers. Dr. Kelly Murphy was born and raised here in Westchester County. She received her Bachelor of Science degree in Animal Science from Cornell University. She continued her studies at Quinnipiac University for a Master’s degree in Molecular and Cell Biology. Dr. Murphy shows her Australian Shepherds in various competitions, including herding, obedience and lure coursing. They have achieved several national rankings over the years. She is an active member with multiple organizations, including Taconic Hills Kennel Club, Saw Mill River Kennel Club, Lions Club International and Therapy Dogs International. Dr. Murphy also volunteers as a leader in the local Westchester County 4-H Club.